The perception of John Calipari is different outside of Lexington, Ky.
No coach in college basketball is as polarizing as Kentucky’s John Calipari. In Lexington he’s nearly a deity. He restored Kentucky basketball to the top of the college game after half a decade in the wilderness. But outside of Lexington? He’s any number of slurs, many of which might be unfair: He’s a job-hopping mercenary (despite the fact he spent eight years at UMass and nine years at Memphis), he’s a cheater (a 2012 CBSSports.com poll of nearly 100 college coaches pegged Calipari as the coach perceived to be the biggest cheater in the sport), he’s more politician than coach ("We don’t just play college basketball," Calipari said with presidential bravado before October’s Big Blue Madness. "We ARE college basketball."). Fair? Not fair? I don’t know. I do know that when a major American sports figure is at the top of the mountain – and there’s no bigger mountaintop in college basketball than Kentucky – we love to knock him off. So I take most of these bad raps with huge grains of salt. But as Coach Cal leads his 9-3, 18th-ranked Wildcats onto the court for Saturday’s matchup against cross-state rival and defending national champion Louisville — the biggest non-conference rivalry matchup of the season — I got to thinking about the one bad rap about Cal that seems to cause the most consternation inside of Kentucky basketball. Has Kentucky basketball, with this year’s freshman-dominated team and Cal’s full embrace of the one-and-done era, become an NBA factory that cynically chews up the nation’s best young talents and spits them out less than a year later? Is Cal a coach who actually forms lasting relationships with his players, or just a recruiter who offers his players a one-year NBA tryout on the biggest possible stage then whisks them out the door and moves on to the next class? It’s an especially worthy question this season, as Calipari has fielded one of the sport’s historically great recruiting classes with six McDonald’s All-Americans and possible No. 1 overall NBA Draft pick Julius Randle. I spoke with a handful of recent Kentucky basketball products in the NBA who played under Coach Cal. I was wondering: In the age of one-and-done — the system Cal has exploited better than any other college coach, unafraid to go after as many top talents as possible this year and reload with more prospects next year – how much of a bond does he actually form with his players, many of whom spend less than a year under his tutelage? Is Kentucky basketball the worst of what college basketball has become, a de facto minor league system that can seem like, as UNC coach Roy Williams once told me, a mere "bus stop" on the way to the NBA? Or do the people who would know best – the players who’ve experienced the Calipari Way up close and every day – think of their old coach not just as one rung on the ladder to the NBA but as someone who cares about their development as basketball players and as young men? That’s the picture Toronto Raptors power forward Patrick Patterson paints of Calipari. Patterson played two seasons at Kentucky under Billy Gillispie and then his junior year under Calipari before heading to the NBA. "Guys want to make him into a villain, into some bad guy, because he does what other coaches can’t do," Patterson told me. "People want to say it’s the easiest job in college basketball (because Calipari gets the most talented players). But in my opinion he has the toughest coaching job in college basketball. He’s at the mountaintop. He’s constantly in the spotlight. You come to Kentucky as the basketball coach, you’re not just a coach — you’re an ambassador for the university. You’re constantly in the public eye. If it happens, it’s gonna be out there, bad or good. You’re constantly judged on anything you do. You have so much expectations. The expectations are through the roof." My talks with several of Calipari’s ex-players who are in the NBA – 27 of his former college players have gone on to the NBA, including 15 in his first three seasons at Kentucky — is by no means a scientific survey. All of the people who’ve played for Coach Cal come from a biased place. The ones I spoke with were ones who made the league, so they’re in many ways indebted to Calipari for their time playing for him, whether it was all four years or a brief one-and-done season. But it was striking how the caring image all of them painted of Cal – Patterson told of a coach who brought in a player’s favorite dessert when it was his birthday, and who left encouraging, handwritten notes to his players – contrasted with the win-at-all-costs image that’s more often portrayed. "He treated all his players like his sons," said Brandon Knight, one of Calipari’s early one-and-done players at Kentucky who was drafted eighth overall by the Detroit Pistons and now plays for the Milwaukee Bucks. "A lot of coaches today, they don’t speak to their former players. I hear from Cal all the time." Knight told me Calipari’s style reminded him of the tough love he got from his own father. Both men would be tough on Knight in practices. And both men would later explain why they got on him so hard. Some of the most memorable times of Knight’s Kentucky career were when he was called into the coach’s office the day after Cal ripped into him in a practice, and Cal explained to Knight the bigger lesson. "Once you find out why, you appreciate it a lot more," Knight said. "That’s the type of thing my dad would do, and that’s what Cal is good at. He’s good at finding out what makes guys tick and finding out what situations make them their best and help the team. He does a great job of knowing what players can and can’t do." Former Kentucky product (and current Detroit Piston) Josh Harrellson might be the polar opposite of the one-and-done types Calipari now gets. He was going into his senior season when Cal was hired. He wasn’t sure if he fit into the new coach’s system and was wondering whether he should transfer. But Cal told him he wanted to keep him at Kentucky, and Harrellson averaged nearly 30 minutes a game his senior year and was drafted in the second round. "It’s just a level of respect guys have for Coach Cal," Harrellson told me. "Guys follow him. He commands respect. You trust in him and believe in him. He’s the same way to you. As a coach that’s so tough to find, a guy who gives you all his trust and his undivided attention." 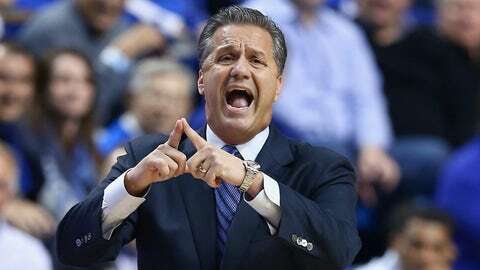 If you get past the bad reputations many pin on Calipari — bad raps that are often reductive — he is a many-layered, complex figure. He’s tough to put in a box, even though we always try to do so. That’s part of the territory when a guy is the CEO of a basketball program with the most money and most history of any, and isn’t afraid to brag on it. But I’d suggest we add one more layer to the stereotypes we all have of John Calipari. Yes, he’s a man who runs the most successful NBA factory in college hoops. But if you talk to the players who know him best, he’s also a man who does it with a surprising amount of humanity. The Cal we don’t see is the one with intimacy and care for these young men, not just in the spotlight during their bus stop in Lexington but long after their Kentucky career is done and the cameras are off.